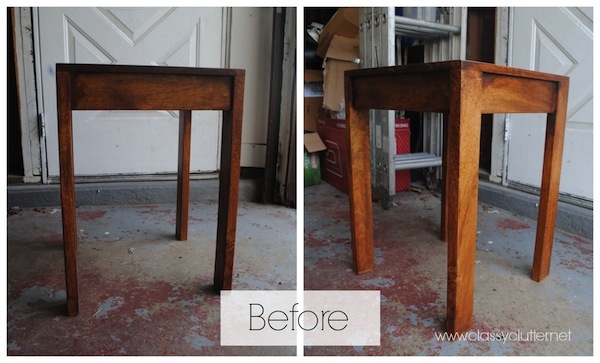 I’m super excited to share with you one of my favorite roadside finds/makeovers! I am a sucker for gold then you pair it with the beautiful wood stain and fuh-get about it! I love it! First, I wiped it down really good and removed all of the gunk off of it. 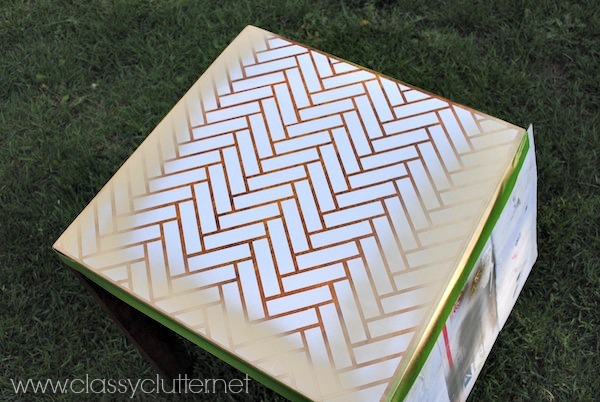 Then, I used my Silhouette and made a herringbone stencil out of vinyl and stuck it on the top. 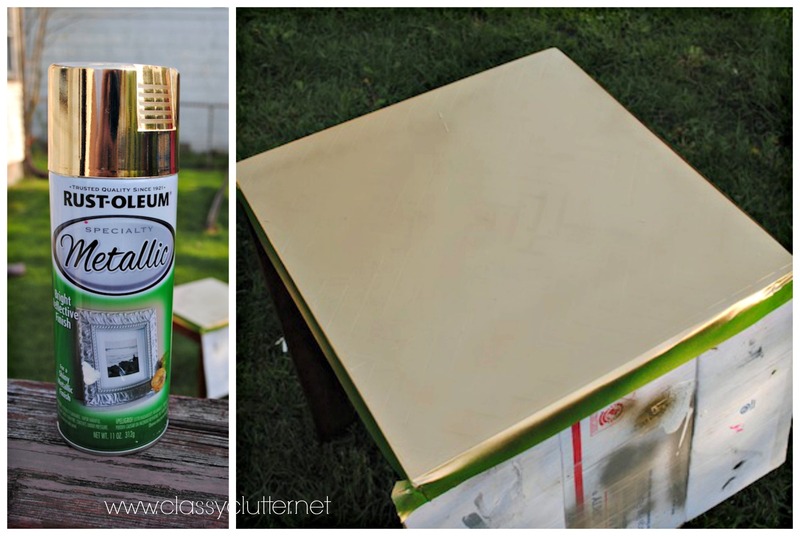 Once I attached the vinyl, I took some gold metallic spray paint and sprayed the top of the table. I really love the wood tone in this piece so I just opted to paint the top only. Next, I rolled a coat of polycrylic over the top to prevent any spray paint from getting scratched off over time. That’s it! Quick, easy and super cute if you ask me! Gotta love free furniture and free projects! Have you found any good roadside finds lately? What did you do with it? WOW, that is awesome. I need to find a table to do this to asap. It’s amazing what people will throw away. 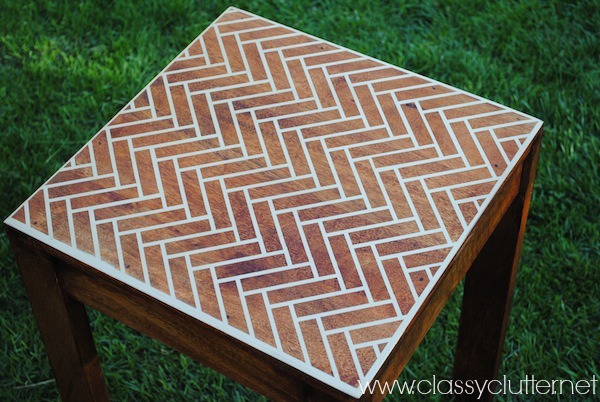 The herringbone pattern is beautiful on the table with the wood showing through. And gold was the perfect choice! Great job! This is really an awesome makeover you have created over here and I would like to try similar kind of DIY at home as I am really inspired from you. I LOVE THAT! You’re right – who would toss that little table away?!?!? Some peeps have no imagination!! Man, I want a Silhouette soooooo bad. LOVE this! I love the wood grain paired with the gold. Wowza that looks awesome! I sooo need to buy a silhouette!! OMgoodness the projects…. Love it! 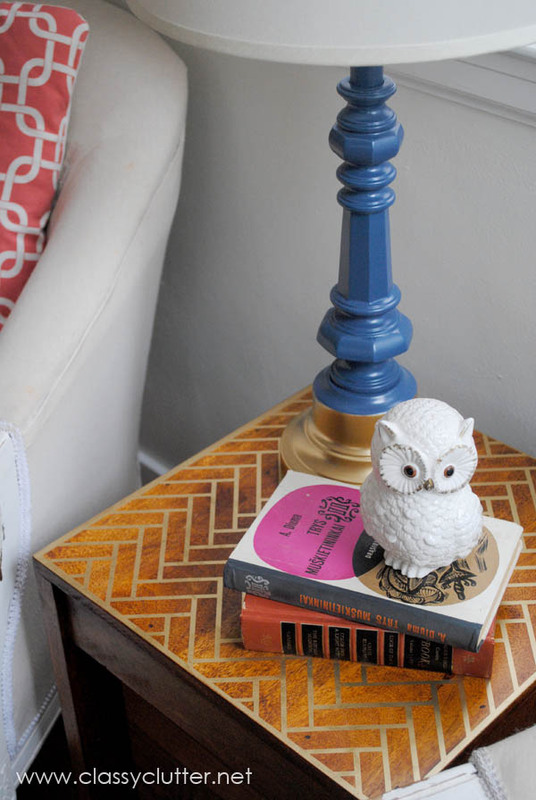 This is such a beautiful way to update that side table. Thank you for the inspiration! Hi, LOVE the result! 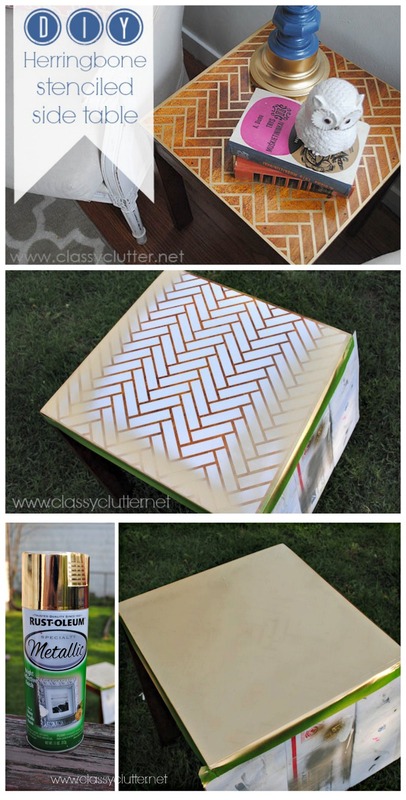 I am probably being thick or over thinking it or something, but how did you create a herringbone stencil that allows you to paint the lines only? I’m racking my brain trying to figure it out! The only solution I can think of, is to scrap the stencil, and use a ruler and a Sharpie pen to get a similar look. I would love to hear how you did it! Thanks!! I realize this post is a year old but I just found it and I really love the project! Could you elaborate on how you made the stencil for me? I’d really like to try this! I made it with my Silhouette machine! Thanks!! Hi, I don’t have a Silhouette. Would you be interested in selling me a vinyl like the one you used for the table? I love the table. Would you be willing to sell me a stencil like the one you made with your silhouette? I want to create a stencil on cork that I’m going to use to line two white melamine trays I just purchased. My plan is to do the herringbone outline in white and then fill in a few shapes with gold at random. 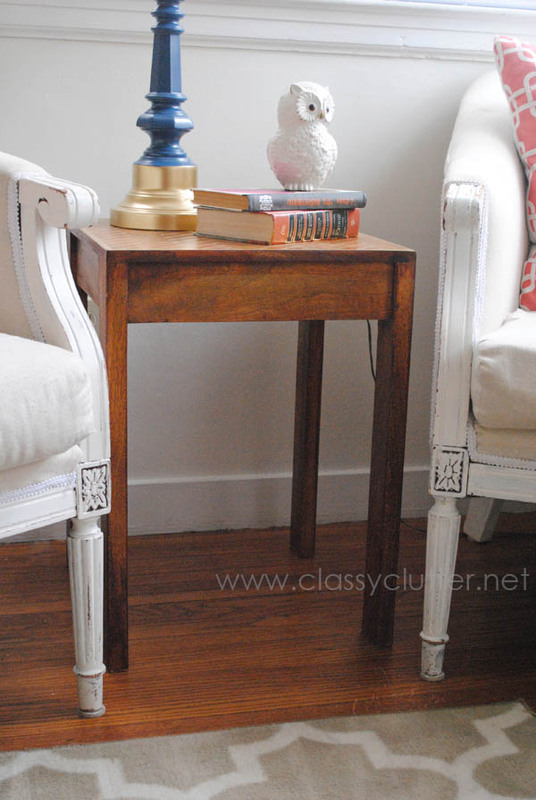 Please let me know if you’re willing to create another stencil just like the one you used on the table. Loved the table and the print. I recently tried this on a table I have and have et done it about 16,73927 times now. I didn’t use a stencil, just painters tape, but more importantly. Even sealing the tape, stencil, etc. How did you not get bleed through with the spray paint? This has been my biggest issue. I really want to do this to my bar cabinet. I do not own a cricket or silohette. 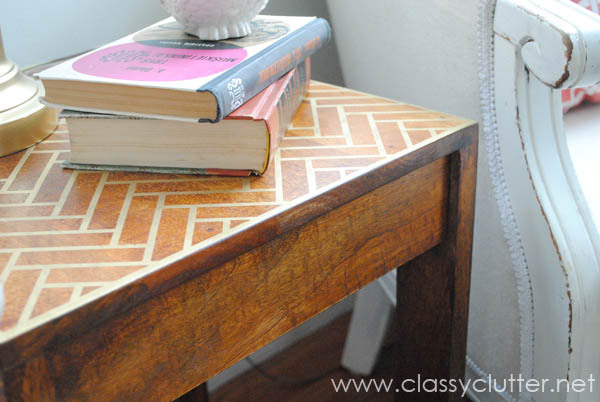 Any ideas on what I can do to get the pattern on vinyl so I can do this? 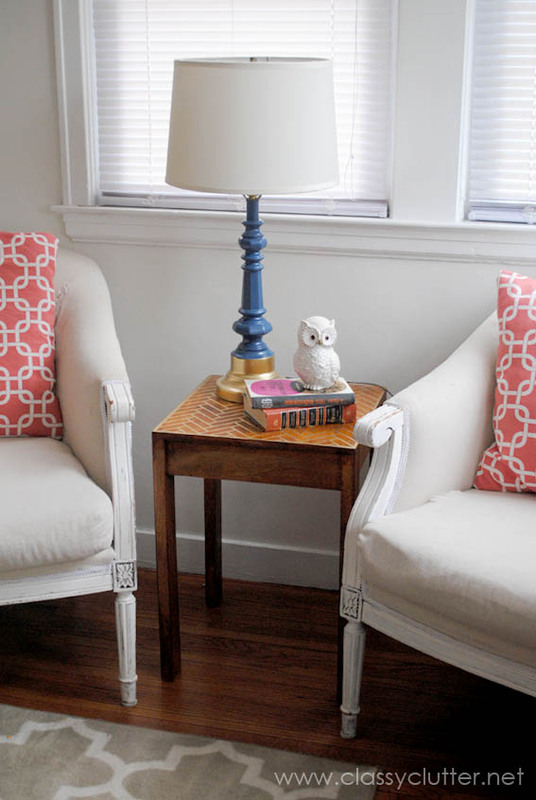 I think your table is adorable but I really dislike posts that say you used a Silhouette machine because we all can’t afford one. Great looking table but can’t make it myself.